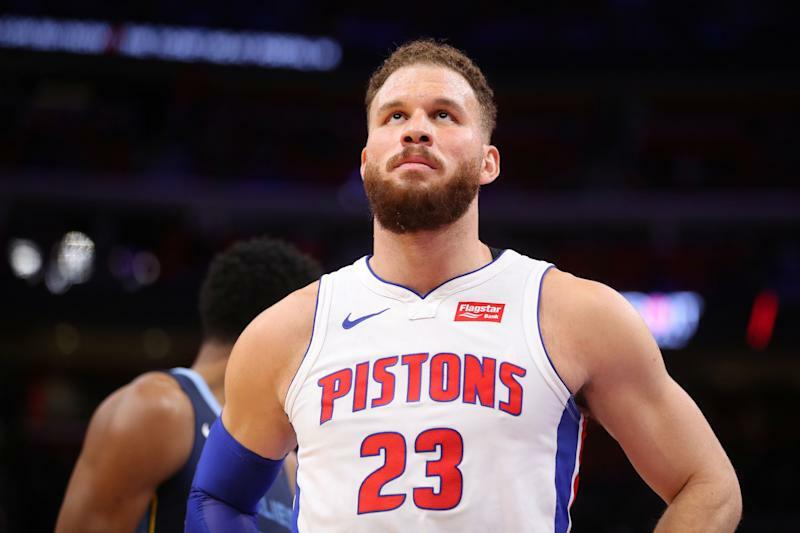 Blake Griffin Will Probably Miss Remainder Of Series Against Bucks – Detroit Pistons star Blake Griffin will likely miss the entire first-round series against the Milwaukee Bucks because of a left knee injury, sources told Yahoo Sports. Griffin has battled the injury for the past several weeks, getting pulled from the Pistons’ second-to-last game against Memphis and missing the season finale against New York, games the Pistons needed to win, and did, to qualify for the last playoff spot. Without Griffin, the Pistons were no match for the top-seeded Bucks in Game 1 on Sunday night, losing 121-86 at Fiserv Forum. After initially missing three games with the sprained knee, Griffin returned April 5 against Oklahoma City to score 45 points, but the knee swelled again and limited his effectiveness two nights later against Charlotte. The Pistons are concerned that could happen in the playoff series against the Bucks, even with the possibility of Griffin having 10 days off heading into Game 3 on Wednesday at Little Caesars Arena. Griffin will be listed as day to day for the remainder of the series, with a league source calling it a “slim chance” he plays this weekend. There’s no structural damage in the left knee, and it’s unclear whether he’ll need some type of minor procedure this offseason. Griffin and team doctors will decide the best course of action when the season concludes. UPDATE: Warriors’ Cousins Expected To Miss Rest Of Playoffs – Golden State Warriors center DeMarcus Cousins is expected to miss the rest of the postseason after injuring his left quadriceps in the team’s first round matchup with the Los Angeles Clippers, reports Yahoo! Sports. During the first quarter of Game 2, Cousins suffered the non-contact injury while trying to chase down a loose ball. Cousins only played four minutes and scored two points before he was injured. The defending champions ended up blowing a 31-point second half lead to Los Angeles and lost 135–131, the biggest blown lead in NBA playoff history. The 28-year-old Cousins signed with the Warriors in July after spending the first six plus seasons of his career with the Sacramento Kings before being dealt to the New Orleans Pelicans at the trade deadline in February 2017. Cousins, who will be a free agent at season’s end, played 65 games with the Pelicans before tearing his Achilles tendon in January 2018. With the series tied at one game apiece, Game 3 is set for Thursday night in Los Angeles. Kings Officially Name Walton As New Head Coach – The Sacramento Kings hired Luke Walton as their coach on Monday, just days after the Los Angeles Lakers parted ways with him following three losing seasons. Neither the Kings nor Walton waited long following changes that came just after the regular season. Sacramento fired coach Dave Joerger on Thursday following a 39-43 finish that was the best record for the franchise in 13 years. Walton was dismissed in Los Angeles a day later after failing to get the Lakers into the postseason in the first year with LeBron James. Kings general manager Vlade Divac met with Walton on Saturday and the two sides quickly came to the agreement that was formally announced Monday. Walton, 39, was 98-148 with Los Angeles in his first full-time head-coaching job, missing the playoffs all three seasons. He was 37-45 this season.